Redesigned from the ground up, the all-new CottonwoodRes.com was purpose-built to more authentically engage with residents, associates, and investors. The website offers interactive apartment search, details about the company story, and career information. Visitors to the newly-released Cottonwood Residential site can begin an apartment search right from the Home Page, finding any one of 65 communities that match their criteria. In addition, visitors can learn more about career path opportunities, benefits, and how to apply. 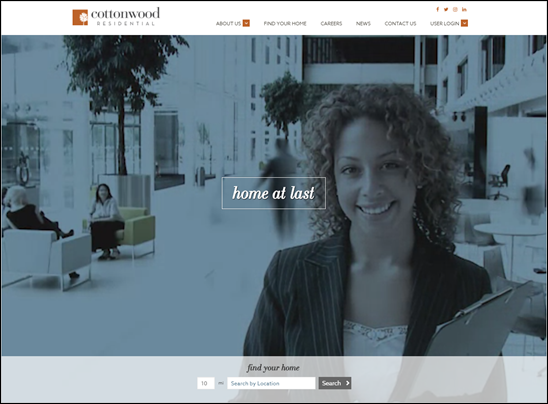 To learn more about Cottonwood Residential and discover the new site, please visit CottonwoodRes.com.